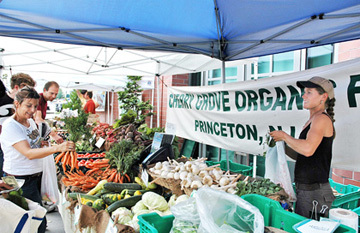 JERSEY FRESH: Now that Princetons own Farmers Market has moved to Albert Hinds Plaza next door to the Princeton Public Library, you can check out books, rent a DVD, and buy some veggies all in one go. Every Thursday the market sells locally produced fruits, vegetables and other food items. By setting aside $2,053,500 to finance part of the cost of the project, Borough Council at its meeting last week tabled the ordinance that would allow for the construction of the new Community Park Pool. The discussion will continue in a joint meeting between the governing bodies of the Borough and the Township on August 16. Attorney Gary Green representing Nassau NHKT Urban Renewal Associates, LLC. and developer Jack Morrison came before Borough Council last week to request changes to the redevelopment agreement concerning 25 Spring Street, also known as Building C. The municipality decided to table the request until further information could be reviewed. In keeping with the Historical Society of Princetons (HSP) summer exhibition themes which typically focus on a human need, according to Exhibition Curator Eileen Morales, their latest show takes a look at unemployments effects in the region and state. The Recession Hits Home: Job Loss in Central New Jersey will be on view at Bainbridge House until August 22. What did a small stone, a pinch of dust, a sliver of bone, a twig, or a few drops of water or lamp oil signify to Medieval Christians? When high-scoring center Scott Findlay blew out his knee last month, things looked bleak for Georges Roasters and Ribs/The Ivy Inn as it chased its third straight title in the Princeton Recreation Department Summer Mens Basketball League. Princeton University Summer Chamber Concerts closed is 2010 season last Tuesday night with a return to the classicsóthe well-established Leipzig String Quartet delved into the monumental chamber music composers Haydn, Webern and Beethoven. Certainly more traditional than the Ahn Trio which opened the Chamber Concerts series earlier this summer, the four members of the Leipzig Quartet (violinists Stefan Arzberger and Tilman Buning, violist Ivo Bauer and cellist Matthias Moosdorf) proved that the classics really never go out of style. Nasty post-nasal drip, sinus pressure and headaches, nasal congestion and blockage, sinus infection  few of us escape an encounter with one of these conditions, and for some people, it can be chronic, ongoing misery.